This post is the first in a series on geomagnetic storms. It turns out that geomagnetic storms are caused by cataclysms on the sun, which fling magnetically charged matter toward earth. The collisions can rattle earth's magnetic field, sending power surges through electrical grids. The high-speed particles can also take out satellites critical for communication and navigation. The main fear is that an extreme storm would so damage electrical grids as to black out power on a continental scale for months, even years. The toll of such a disaster would be tallied in economic terms, presumably in the trillions of dollars. It would also be measured in lives lost, since all the essential infrastructure of civilization, from food transport to law enforcement, now depends on being able to plug things in and turn them on (NRC 2008, pp. 11–12). Having examined the issue, especially its statistical aspects, I am not convinced that this scenario is as likely as some prominent voices have suggested. For example, as I will explain in a later post, Riley’s (2012) oft-cited estimate that an extreme storm – stronger than any since the advent of the modern grid – has a 12%-per-decade probability looks like an unrepresentative extrapolation from the historical record. I put the odds lower. My full report has just been posted, along with data, code, and spreadsheets. Nevertheless, my reassurance is layered in uncertainty. The historical scientific record is short – we get a big storm about once a decade, and good data have only been collected for 30-150 years depending on the indicator. Scientific understanding of solar dynamics is limited. Likewise for the response of grids to storms. My understanding of the state of knowledge is itself limited. On balance, significant “tail risk” – of events extreme enough to cause great suffering – should not be ruled out. This is why I think the geomagnetic storm risk, even if overestimated by some, deserves more attention from governments than it is receiving. To date, the attention has been minimal relative to the stakes. The rest of this post delineates how geomagnetic storms come about and why they may particularly threaten one critical component of modern electrical grids, the high-voltage transformer. Later posts will delve into what the available evidence says about the chance of a geomagnetic "perfect storm." A distinctive feature of the geomagnetic storm issue is the sequential, probabilistic nature of the phenomenon of concern. The storms originate in cataclysmic explosions on the face of the sun with the power of a billion hydrogen bombs. Each event may throw off some amount of magnetically charged plasma – from tens of megatons to tens of gigatons (Gopalswamy 2006, p. 244). In the abstract, this coronal mass ejection (CME) has some probability of hitting the earth, which depends on the CME's angular breadth. If the CME hits, it will do so at some speed, perhaps as high as 1% of the speed of light, 3,000 kilometers per second. The CME’s magnetic field may by chance point substantially in the same direction as the earth’s, producing a magnetic collision (Gopalswamy 2006, p. 248) rather like slamming together two magnets the way they don’t want to go. Sometimes several CMEs will fly out over a few days, the first clearing a path through interstellar matter and speeding the transit of its successors. Each magnetic blast will, over hours or days, bend the earth’s magnetic field. This will accelerate electrical currents that flow at great heights above the planet, such as the "electrojets" that cause the Aurora Borealis and Aurora Australis. The gusts of solar weather will also strew turbulence in the earth’s magnetic field, like a strong wind over water (Kappenman 2005, p. 6), producing even sharper, if more transient and localized, magnetic oscillations across the surface of the earth. Scientists will declare the arrival of a geomagnetic storm. According to the laws of electromagnetism, when the magnetic field fluctuates in a spot, it induces a voltage there. The faster the magnetic change, the greater the voltage. Before the Industrial Revolution, electrical pressures induced by magnetic storms could only be relieved by the flow of electric charge through air, sea, or land. But now people have laced the planet with less resistive conduits: high-voltage power lines stretching hundreds of miles. Especially when crossing terrain whose (igneous) mineralogy resists electrical current – or when terminating near conductive seawater – and especially when the wires happen to align with the induced electrical force, these cables become geomagnetic lightning rods. Like lightning rods, long-distance, high-voltage power lines are grounded: for safety, they are connected to the earth at either end. But at each end of most of these power lines, interposed between them and the earth, are transformers, garage-sized or bigger. Transformers put the “high-voltage” in “high-voltage power line.” In preparation for long-distance transmission, the transformers take the electricity produced by a windfarm or coal plant and step up its voltage, to as high as 765,000 volts in the US. They feed this transformed electrical energy into the long-distance lines. (Boosting the voltage for long-distance transmission cuts energy losses from the electrical resistance of the power lines.) At the receiving end, similar transformers symmetrically step the voltage back down for distribution to factories, offices, and homes. Transformers exploit the symmetry of electromagnetism: just as a changing magnetic field induces a voltage, so does the movement of electrical charge (electricity) produce a magnetic field. Inside each transformer, two wires, one connected to the input line and one to the output, coil hundreds of times within or around a shared core of magnetically permeable material such as silicon steel. The normal input is alternating current (AC), like that in an ordinary home, its voltage flipping from positive to negative and back 50 or 60 times a second. The oscillating electricity in the wire produces an oscillating magnetic field in the transformer’s core. That in turn induces an oscillating current in the output wire, typically at a different voltage. The capacity of AC to be transformed in this way for low-loss, long-distance transmission is precisely why at the dawn of the electrical age AC beat out DC – constant, "direct" current – as the standard for power systems. Under design conditions, a transformer’s core is magnetically capacious enough to carry the whole field produced by the input wire. But if too strong a current enters, the core will saturate. Magnetic force fields will stray out of the core and into the surrounding wires, where they can exact invisible mayhem: random currents in both the input and output wires and “hotspots” of burnt insulation. Possibly, the transformer will fail immediately. Or it may continue operating while the hot spots cool into something analogous to dots of rust: they escape attention at first, but initiate degradation that spreads over weeks or months. Eventually a failure may be triggered, which engineers may not even recognize as storm damage (Albertson et al. 1973, p. 475; Gaunt and Coetzee 2007, p. 444). High-voltage transformers are nodes in the grid. When they fail, links in the power system are sundered. 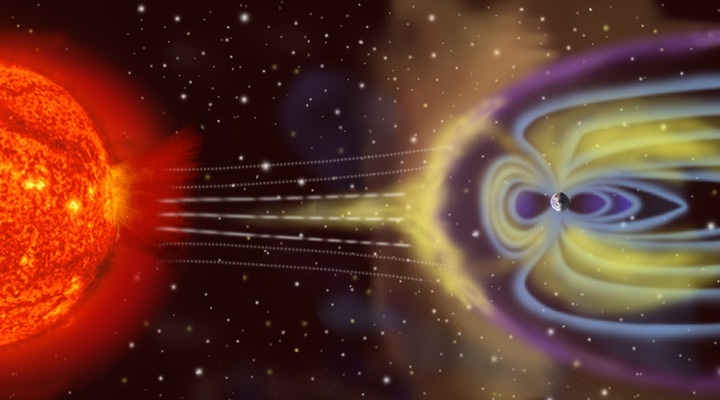 Geomagnetic storms can send damaging currents into transformers in two ways. The storms can directly induce them, as just described. Or the storms can disrupt currents, voltages, and frequencies in an operating grid enough to overwhelm the equipment meant to counteract such distortions, and thus trigger shutdowns of power plants or disconnections between sections of the grid. These automatic responses are designed to protect the grid, and may largely do so—but perhaps not completely in extreme cases. In Québec during the great storm of March 1989, the sudden disconnection of the La Grande hydroelectric dam complex from the rest of the grid overloaded and damaged two big transformers, part of a larger cascade of events that led to a widespread blackout (NERC 1990, p. 42). In the worst case, argues geomagnetic storm expert John Kappenman, a storm would take out hundreds of high-voltage transformers across a continent-wide area. High-voltage transformers are large, expensive, custom industrial products. There are not a lot of spares around. New ones take months each to manufacture, and limited global production capacity could produce a backlog of years. The effects of a long-term blackout would cascade to all corners of industrial societies – pipelines, sewage treatment, police, air traffic control, hospitals. The scariest potential consequence is the loss of cooling at storage facilities for spent nuclear fuel, as at Fukushima in 2011 (Foundation for Resilient Societies 2011). Offsetting such risks is the paradoxical resilience built into grids, as seen in Québec. If a geomagnetic storm sufficiently distorts the current entering or exiting a major transformer, safety equipment trips, shutting it down. Large areas may be blacked out within seconds. But, contend Ramsis Girgis and Kirin Vedante of transformer manufacturer ABB, the quiescent grid may be protected from more permanent damage. Short-term fragility bestows long-term resilience. In Québec, power was largely restored (after nine hours), and life went on. In addition, the power system is arguably more prepared for electrical storm surges today. Satellite-based warning systems are more sophisticated (“GoreSat” was launched on February 11 to strengthen capacity to monitor solar activity). Since 1989 utility officials have wisened to the danger and are perhaps more ready to preemptively shut down grids to protect them. And some systems have been modified to make them more robust. In the end, I did not achieve an understanding of power engineering well enough to make a call on these contending considerations. I am convinced, however, that how power systems will respond to extreme geomagnetic storms has been too little researched. Few experiments have been conducted under realistic conditions. Much of what is known is locked in the minds and computers of transformer manufacturers and power system operators, who may have incentives not to share everything they know. My next few posts will focus on a question I am more competent to explore, which is what the historical record tells us about the probabilities of extreme storms in the future. A 2-megaton nuclear detonation would by definition release 2 × 4.184 PJ = 8.368 × 1022 erg. Gopalswamy (2006), p. 244, reports that CMEs can attain kinetic energies as high as 1032 erg, a billion times larger. Reading the analysis of global catastrophic risks in this post and elsewhere here, I noticed that many of these risks can be mitigated by improvements in our space technology and space industrial base. That may be a case of everything looking like a nail to someone with a hammer (as my career is in satellite remote sensing of the Earth), but it still seems worth pointing out. For example, the geomagnetic storm GCR can be mitigated through spacecraft that study and monitor the sun. NASA's Heliophysics division and NOAA's Space Weather branch play a role here, but much more could be done. Communication, Earth imaging, and GPS satellites could provide essential services following a severe geomagnetic storm, but only if they themselves are designed to withstand the event. Some even envision space power satellites that could beam power to disaster-stricken areas. The Near-Earth Asteroid threat could be mitigated by a space telescope like the Sentinel mission proposed by the B612 Foundation. A less expensive approach might be to nudge the NEOCam NASA Discovery mission proposal so it has a better chance (it faces a couple dozen competitor missions). Numerous other space and ground based efforts could be made to detect NEOs, better understand NEOs, and more effectively be able to deal with an incoming NEO. The funding required for these varies from expensive space agency style missions to small grants. As with the space telescopes, these also tend to have other benefits (e.g. : science, improved space industrial base, understanding the potential to use NEO materials as resources). Many have proposed non-traditional procurement methods (data purchases, prize competitions, etc) to reduce funding requirements to achieve space-related goals, so investments in the hundreds of millions of dollars like that required for Sentinel can be avoided. The anthropogenic climate change GCR also can be mitigated with space systems. Satellite remote sensing of the Earth is used in many ways to study and monitor this GCR as well as numerous other environmental concerns, yet only a fraction of the monitoring proposed by the NRC is being done by NASA and NOAA. Serious contributions now appear feasible using low-cost small satellites, and recently private industry has shown some interest in this area, but this market is new and seems fragile. Satellites can contribute in many other ways beyond environment monitoring. For example, communication satellites can reduce the need for physical travel and can improve management of energy-using devices, and the Iridium Aireon service is supposed to help lower airline fuel use. Satellite remote sensing is likely to be able to contribute towards mitigating other GCRs like large volcanic eruptions (satellite data is used to study volcanoes), nuclear weapons (satellite data can detect and therefore discourages ICBM launches, and can be used to help monitor nuclear development sites), and biosecurity (satellite data can help monitor or predict the spread of disease). Improved remote sensing might be a way to use space technology in ways that cuts across multiple GCRs (as well as to provide many other benefits to humanity unrelated to GCRs), but there are probably other ways to do that, too. Finally consider that the goal of many in the human spaceflight field is to spread humanity and life in general throughout the solar system and beyond. If self-sustaining societies can eventually be developed beyond Earth, we will have a good defense against many of the GCRs. Steps toward this goal (which implies survival in extremely harsh environments like deep space or other planets or their moons) are also likely to increase our ability to survive GCRs on Earth.